Chris Paprota is a working musician, with almost two decades of experience on the drums. He has learned firsthand from notable players/educators, such as Dom Famularo, Neil Garthly, David Garibaldi, Claus Hessler, Dennis Chambers, Horacio Hernandez, and many more. 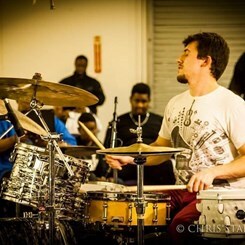 As a performer, Chris has worked in a variety of genres and musical settings (Rock Bands, Blues Bands, Jazz Bands, Fusion Bands, Pit Orchestras), and currently works as a Modern Dance Accompanist at Stockton University, and also plays drums/composes for Philly based fusion band Gnarbot. He is also endorsed by Meinl Cymbals. In addition to his drumming expertise, Chris is a competent guitarist/composer ,with a great understanding of music theory. When teaching, he strives to convey each lesson in relation to a bigger musical picture. Request Lessons with Chris Paprota today!